The day after the Pocatello Marathon we visited Park City's Utah's Olympic Park and Winter Olympics Training Center. The Center is still an actual training facility, but has a lot of activities for tourists to participate in during their visit. 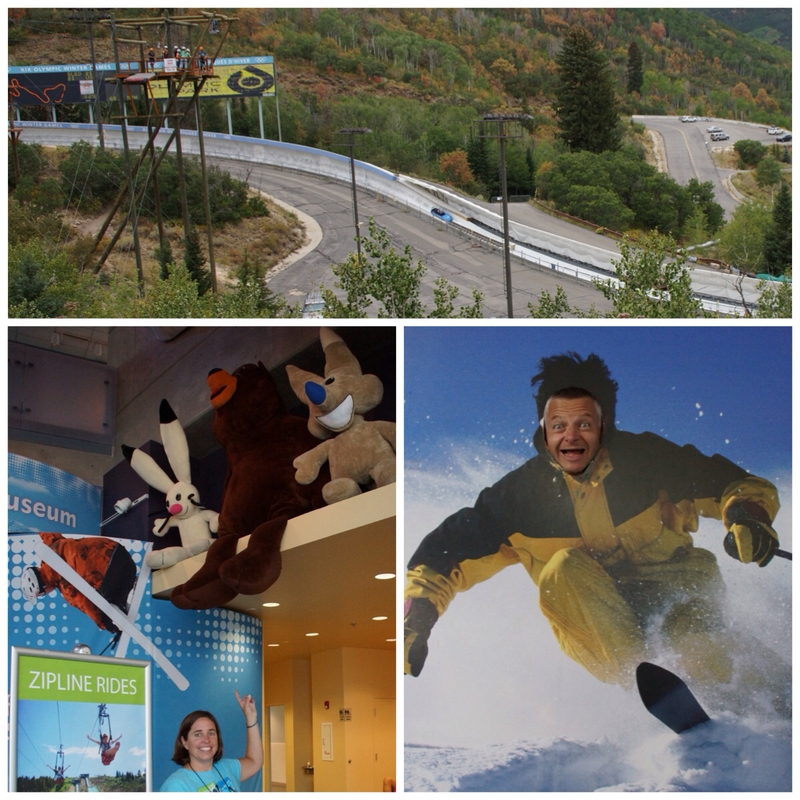 Activities include the museum, bobsled rides, ski jump show, alpine slide, zip lines, ski lifts, adventure courses, etc. You can pay for activities individually or under bundled tickets. We bought a silver pass that gave us access to one ride on the zip line/drop tower, extreme zip line, alpine slide, plus unlimited ski lift rides for $45/pp. When we were planning our trip out west we originally planned to take the bobsled ride - at speeds of up to 70 mph. About a week before the trip we altered our plans and nixed the bobsled because 1) we didn't want to sit through an orientation and 2) we didn't want to have our heads banged around for a minute. 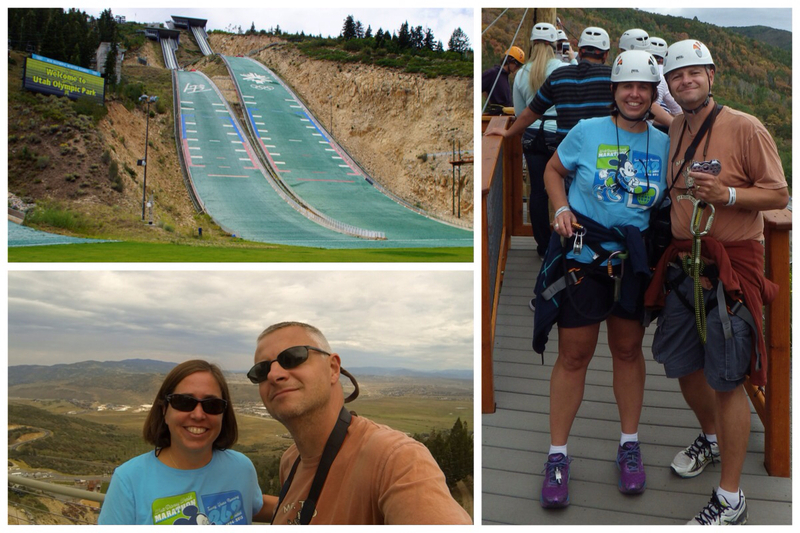 After watching a few minutes of the ski show, we took the ski lift to the extreme zip line. This was going to be our first zip line experience so why not make it extreme? The line starts at the top of the ski jump ramp and takes a sharp angle downward to the base. Riders sit in a sling chair vs. hanging from the rope. 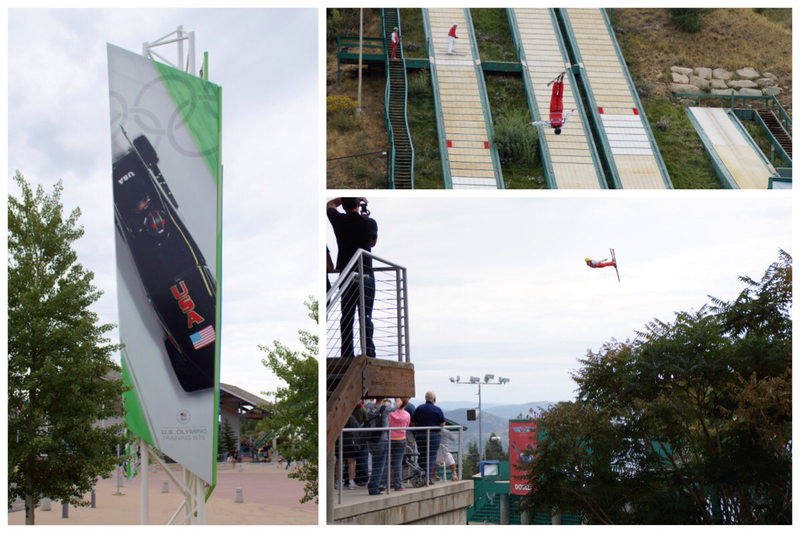 According to the website it is one of the steepest in the world and riders will reach speeds up to 50mph. The setup allowed us to ride on separate lines running side-by-side. Holly is a little predisposed to having some height anxiety so the build-up to launch was a little tense. Dave could hear her telling the attendant that he was going to be killed for this idea. Overall the ride looks more intimidating than it actually was. It's super-fun and gives a great view of the valley. Next we rode the alpine slide. This version was a stainless steel single track ride that sent sleds down the mountain at speeds up to 30mph. There were a few sharp turns so riders had to be conscious of their braking. Dave's ride was better than Holly's ride - she had two little kids on the slide in front of her that didn't weigh enough for them to maintain speed, so she had to basically stop midway. The final event was the zip line to the drop tower. This is how the park's website describes the attraction: "This advanced-level adventure is designed to test the thrill-seekers with a 377-foot long zip line high above the treetops finishing at the 65-foot high Drop Tower. From the Drop Tower there is ONLY ONE WAY DOWN – simply step off the platform for an exhilarating, 65-foot free fall. The Drop Tower will challenge the mental fortitude of even the toughest participant." We spent about three hours at the park with most of that time walking or standing in line. Prices were reasonable for the experiences we had and values seemed to improvedas you bundled more activities. 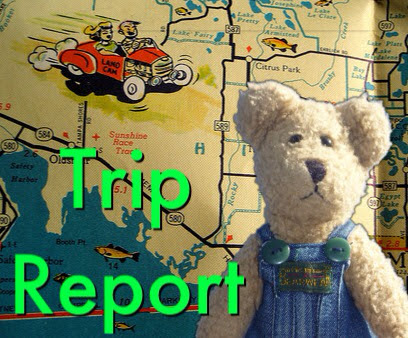 Here's the video from our visit. Once we made it back to the hotel we needed a snack and a beverage. 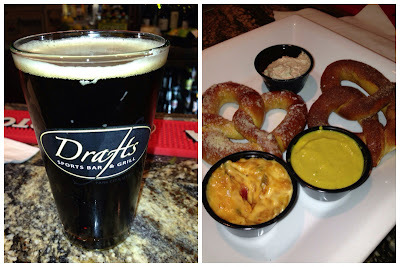 We walked over to the Sundial Lodge and found our way to Drafts - a beer-focused bar. We got to sample a few nice beers from Utah including Uinta's BaBa Black and Shades of Pale 4-Play Porter.